Date Added: Thursday 22 December, 2011 by David S.
Date Added: Friday 22 April, 2011 by Mark F.
Date Added: Wednesday 01 December, 2010 by Mark F.
Date Added: Wednesday 18 March, 2009 by steve f.
So I took the plunge and asked Indy if he would make the Quantum Overcoat. Again, I was a "ginnie pig" for this project. (The other "ginnie pig" projects being the Royale Tuxedo, and the Quantum Suit. Both of which are terrific by the way.) I received the coat a few weeks ago in time to wear it for the last weeks of winter. Upon my first observation the coat seemed a bit long. I took it to my tailor and we shortened it up a little bit. NOW it is absolutley a killer jacket. 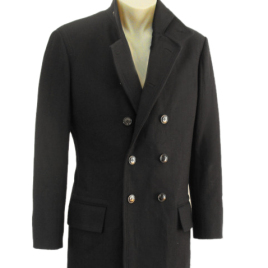 The jacket definatly stands out amongst the wool overcoat crowd. Its haute couture enough to satisfy the sartorlist crowd and can be dressed down for a more trendy casual look. Either way it will turn heads. I had the jacket made in wool with a skeleton lining thus giving it a much more exact fit. Believe me when I say that this jacket fits like a glove. I opted for wool instead of cashmere on this go around for the simple matter of longevity. I often carry a briefcase over my shoulder and cashmere has a shorter life expectancy than tried and true wool. However, perhaps my next go around will be a fully lined and cashmere version?? Overall, like many of Indy's products this jacket is amazing. You know you have something special on your hands when your tailor tells you that your coat was the talk of the shop! !..